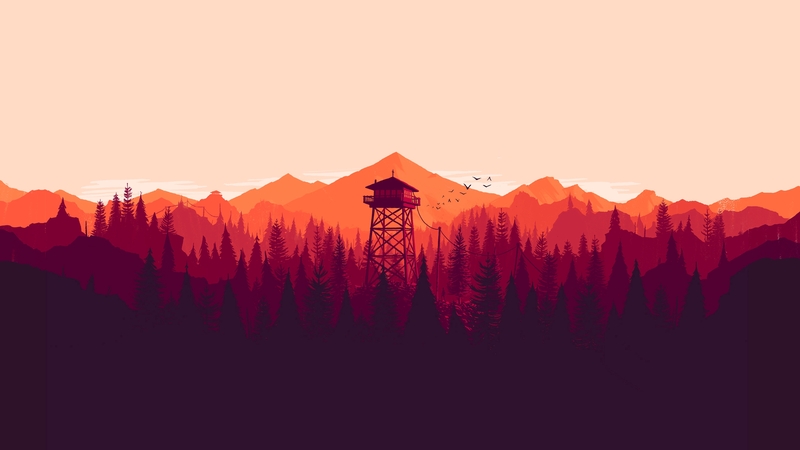 Firewatch started as an amazing experience. Beautiful visuals. Engrossing story. Captivating characters. A romantic escape into a fictional universe based on a real one wrapped around an unnerving mystery begging to be solved. Plus I found a turtle and named him Turt Reynolds. But then about four hours into my five hour run with the game I thought, “oh… that’s it?” And then it ended. Set in 1980s Shoshone National Forest in Wyoming, players take on the role of Henry a fire lookout assigned to his own station. His boss and coworker, Delilah is the only other person he has direct contact with on a daily basis, and she’s just a voice on the other end of a walkie talkie living far away in another tower. Their job is to keep an eye on the forest and report any fires, and prevent campers from starting new ones. Like the other recent stylistically unique indie game, Oxenfree, Firewatch is not an action-based adventure game, but a dialogue-based one. It’s a very nice concept. Various problems arise within the forest and it’s up to Henry to address them, and while he is off trekking through the woods, he talks about his past and his decision making process to Deliliah on the walkie. The forest is huge and can be explored at your own pace. And it is gorgeous. Desktop and phone background-type gorgeous. And the banter between Delilah and Henry is spot on. It might be some of the best voice acting we’ll see all year. Their relationship swings between professional, to friendly, to flirty, and back again all without the usage of facial expressions or body language. My emotions were swinging with them. As I explored the forest and became increasingly familiar with my surroundings, I was absorbed into this life. And then, someone starts listening in on the conversations. I would never call the game scary, but it does get tense. Activity in the game is on the minimal side. There’s no fighting. There’s no quicktime events. You follow your map from A to B to C and just traverse the environment carrying on a conversation with Delilah. You don’t have to worry about health or inventory management or getting tired from running. It’s a very down-to-the-essentials type of experience. The whole world meshes so well: the forest, the isolation, the clever and believable dialogue, the excellent soundtrack, the sinister nature of someone else watching. But in the finale, the big story reveal doesn’t hold up and essentially took the wind out of my sails, so much so that I got frustrated. The life Henry left behind was more frightening than his life as a fire lookout. I realize there’s a sort of cleverness to that, an escapist playing the role of an escapist, but it just felt like a missed opportunity. I don’t mind that the game never got “scary” but the amount of tension built up wasn’t proportional to the emotional payoff. As a story-based game I can’t see much room for replayability. Like Heavy Rain and Oxenfree, it’s hard for me to go back into this world knowing what the outcome is. And that makes me sad. The game ran fine on my machine. I never crashed. I didn’t run into any weird performance issues. The occasional invisible walls irked me, but they by no means ruin the game. On PC, there is a feature where you can take photos with a disposable camera and then upload to a website to order actual prints sent to your home. $15 for a set of 24 4” x 6”. I personally would never buy them, but I thought it was a clever little idea that you won’t find in any other game and either intentionally or unintentionally puts you back in the 1980s again waiting for rolls of film to develop. This is a tough one to call. I know it should be about the journey and not the destination, but it’s hard to say that when the destination makes you feel like the journey wasn’t worth it. Great world, good concept, amazing voice acting, beautiful visuals, but the story is what slapped the ball out of my hands… and then deflated the ball… and then dropped the ball at my feet and walked away. But subjective criticisms about the story aside, for a five hour experience at a $20 price tag with little or no replayability, I don’t think it’s worth the full price.